and we will be celebrating our 50th Anniversary in 2019! We are the oldest florist in Oviedo. The only other shop in town is about 5 years old. But what is more important is what that means. It means we do OUTSTANDING work! We have achieved Teleflora 500 the past 5 years and Teleflora 1000 since 2000. That mean we are in the top 1000 or top 500 of some 20,000 florist shops nationwide! We don't advertise except for our websites, social media, and thru local school papers. In other words, our business is largely word-of-mouth, referrals, and repeats. Our customer base is HUGE because once someone uses us, they come back to us. GENERATIONS of people in the greater Oviedo area have put their trust in us. We have moved to larger buildings three times (A GREAT "problem" - Thank you for helping us to grow!!) but have never let our quality slip. We know you order from us because you want that something special touch - and we do our utmost to deliver exactly what you want. We are service oriented. Indeed, every homecoming and prom we fix what others have produced. We don't advertise except for our websites, social media, and thru local school papers. In other words, our business is largely word-of-mouth, referrals, and repeats. And while it seems only complainers post ratings on-line (except our brides! ), we are proud we get emails, letters, phone calls - on almost a daily basis - telling us how wonderfully we fulfilled their wishes. We are proud of this! Because of our simple mission: to create and deliver delightful floral arrangements and gifts. We diligently strive to keep our word to you - from taking your order to artistically creating your arrangement using fresh product to delivery. Let me tell you: because we deal with fresh product, keeping our promise is a challenge. But we have the experience and dedication to do that. We often come in early, stay late, work when we should be closed, etc. to make sure we meet your commitment. We go to extraordinary lengths to make a commitment to create something unusual. We check and double check. Unlike other "check the box" florists, we call you if we are not sure. We fret over each creative arrangement; designers often getting second opinions from other designers. Our drivers don't just take deliveries to the door. They quality check and go to extraordinary lengths to make sure what you order is delivered on time and in great condition. Our staff !!! 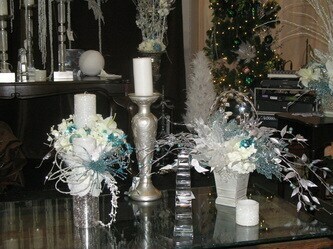 : We have four floral designers on staff who bring over 75 years of combined design experience to wow you. Our sales people are knowledgeable, courteous, and dependable. Our drivers know how to add that final special touch to ensure your order gets the best possible impact upon delivery. More on the staff page (coming soon). 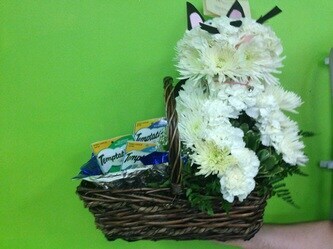 Our designers created this puppy and the cat below per customer request. Our designer's love these kinds of challenges - and they have fun doing them! What are you imagining that we can make a dream come true for YOU?!! We get fresh flowers DAILY. This is NOT true of all florists. Smaller shops may buy as infrequently as once per week. 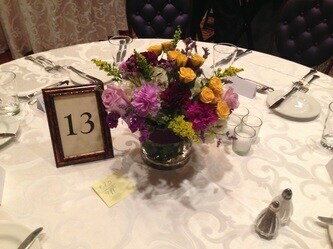 What this means is YOU can rest assured that the flowers used in your arrangements are as fresh as possible. NOTE!!! : sometimes you DO NOT want flowers the same day they arrive. Some flowers (like roses) need conditioning. We make sure your flowers are prepared to delight for as long as possible. Why do we get flowers daily? Because we have high turnover do to the many orders we fill. This is important to consider because it not only means we get fresh flowers daily - it means our designers, sales staff and delivery staff all get LOTS of experience with each order! 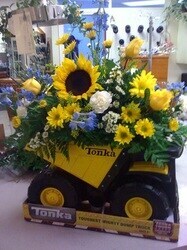 We are a "Top 500" Teleflora Shop - and have been either Top 500 or Top 1000 since 2000. We even achieved "Teleflora 500" in 2006 and in 2010, 2012, 2013. Yep! 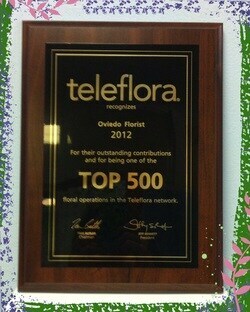 We earned Teleflora 500 this past year! And we fully expect to do so for 2014. Teleflora is the premier floral network. To just be a member, a shop must be able to prove it is able to meet the exacting standards set by Teleflora. 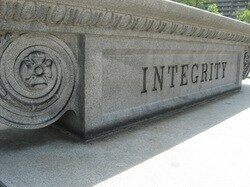 We are constantly inspected - to include secret shopper inspections. 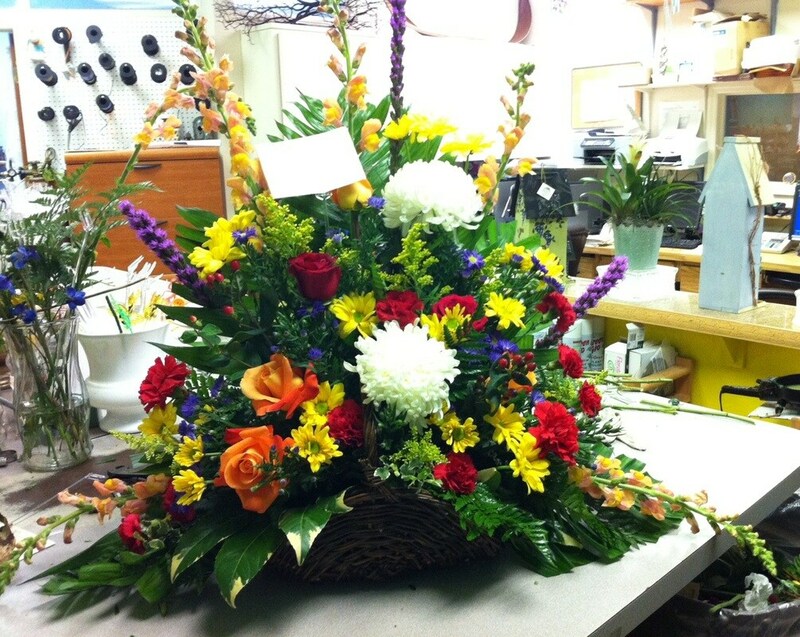 We are also evaluated by other florists throughout the Teleflora network. To be a "Top 1000" florist means we are among the top 1000 of some 20,000 florist shops - world wide - in terms of quality of our work, volume of business, and ability to meet the exacting and rigorous standards of Teleflora. To be Teleflora "Top 500" means we are in the top 500. As you might imagine, both "Top 1000" and "Top 500" are hard to earn. And we are one of the only shops in Florida to earn it consecutively since 2000! What this means to YOU is that you can trust Oviedo Florist has the talent AND commitment to ensure you get the best return possible for your floral dollars. It means we will EARN your trust along with earning your business. 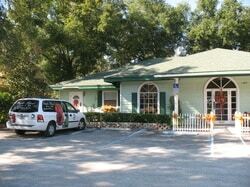 Your Oviedo Florist calls home a 3,000 square foot, stand-alone building. Most florist shops are in about 1000 square feet. We have the space to store inventory. We can buy in bulk so our costs are lower - savings we pass to you. But, importantly, we can buy quality items (many have minimum order levels) - quality we also pass to you. In our 40 years of doing business, we have collected an impressive collection of containers, design accessories, ribbons, baskets, floral containers (vases, ceramic ware, etc), stands, special tools, and more - (one reason Oviedo Florist kept moving to larger spaces!). What this means for you is that we have a wider variety of choices to make what you want SPECIAL. We also have the space to provide necessary separations. For example, fruits exude chemicals that will actually deteriorate flowers. So, any fruit brought into the shop for gift baskets is stored in a separate room - well away from any flowers. Most flower shops do not have the space to do this; most will store fruit in the same cooler as flowers - A BIG NO-NO! A side note: we have just remodelled our showroom. Come visit and see! Take a VIRTUAL TOUR of our shop (click here or the picture of our shop above). Taken May 2015, it will give a great example of our shop. We say "example" because we are constantly re-modeling our shop to keep it fresh. What else would you expect from a shop with World Class Designers who are bursting with creative energy?!!!? We have three coolers with well over 500 square feet of refrigerated space. Most florists have a 4 by 8 foot cooler or only 32 square feet of refrigerated storage. We have one of those - for pick-up or special orders. But we also have an addtional 10 by 15 foot cooler. With OVER 150 SQUARE feet of refrigerated storage, we can keep your floral order properly refrigerated - from the time the raw materials come in until your arrangement leaves our shop to be delivered in our air conditioned van. This is important for ensuring both quality and longevity of your order. We properly condition flowers before use. What does this mean? This means we go thru a very exacting and rigorous series of steps. These steps add time and effort but your order is worth it! a. We prepare our flower buckets by cleaning them with a special floral disinfectant. It is a ritual known fondly as "scrubbing the buckets". b. As stated, we get flowers daily. d. After an appropriate time of feeding and hydration (and allowing flowers to fully develop), we then place them in refrigeration to preserve them at the peak of beauty. 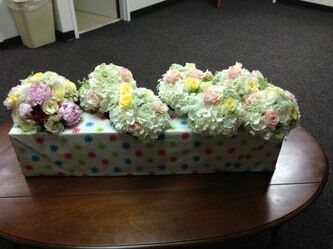 e. Our floral designers know how to cut and manage arrangements so they stay fresh until delivery. f. We use SHARP tools and the PROPER tools. This may sound trivial but dull tools and/or improper tools damage flowers. g. Our delivery vans have COLD air conditioners. They also have special floral arrangement carriers that prevent arrangements from bumping into things and into each other and from tipping over. 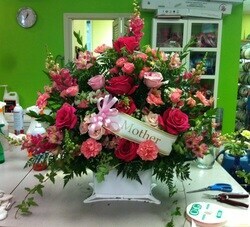 They are also large enough for very tall and very large arrangements. We have a state-of-the-art Point of Sales system, affectionately called "Daisy". A Point of Sales system means we are able to take and manage your order electronically. This includes developing an electronic record of your order that gets distributed to our staff for work, processing payment securely, maintaining a secure data base for the next time you order, electronically managing deliveries to ensure on-time deliveries, and so much more. Security of your personal data is one of our topmost concerns! NOTE: We NEVER share your personal information with any other person or business except to conduct Teleflora business - including processing orders with other florists in the Teleflora network. And Teleflora is very, very committed to ensuring its data networks are secure. Many shops do not have a Point of Sales system. We feel this is one of our very best investments towards the very best customer service. Weddings are a big deal to us. We do very little wedding advertising or promotion. Yet, we have a healthy wedding business (with room for more, of course!). 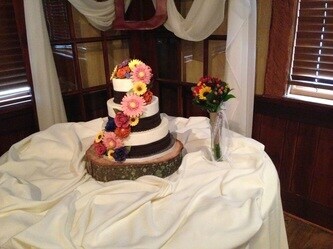 Weddings are a big deal to us! We have done weddings for three generations in some families. We get the bulk of our business from referrals. We start with a free wedding consultation, going thru an exhaustive interview form (our wedding tab). We work with the bride to ensure we both understand what the bride is dreaming of and what expert advice we should offer. And, of course, we work to get the most out of the budget given! 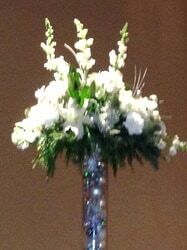 We do wedding flowers as well as reception flowers. We spend alot of time. Some consultations take over an hour or take place over several meetings. 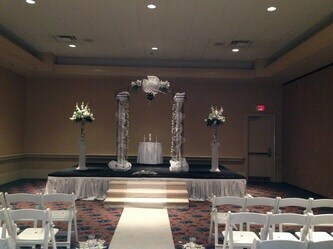 If your wedding is a big deal to you - come to us. Because weddings are a big deal to us - and to you. 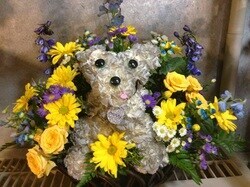 We treat sympathy flowers with great honor and dignity. We know the loss of a loved one is hard. Flowers are meant to provide comfort to reduce that hardship. We know this. So, our policy is to deliver within the hour preceding the time requested. Most funeral director s want flowers 1 hour before a service. We deliver within one hour of that set time; as a rule and policy -with very few exceptions. Also, although we are closed on Sundays, we deliver flowers for Sunday services on Sunday (unless expressly told not to). Why? Because we do not want wilting flowers causing more pain. 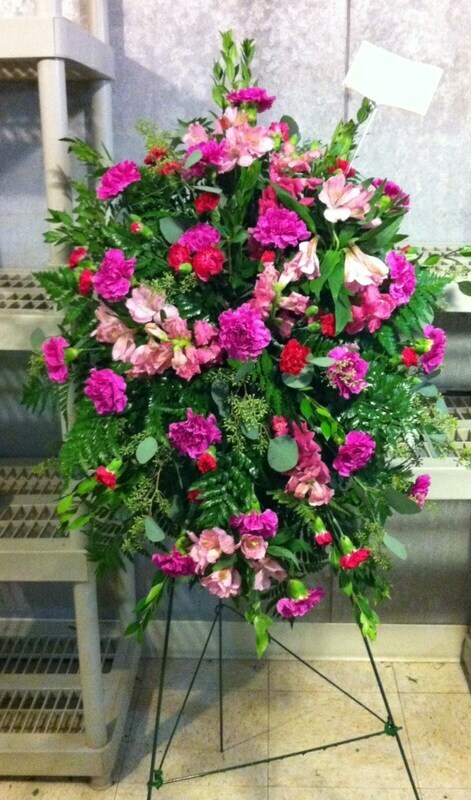 Some florists will deliver flowers on Saturday; even Friday; for a Sunday service. 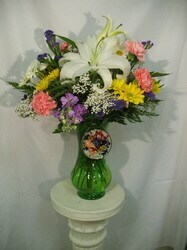 The nature of sympathy floral arrangement is that most are not in water reservoirs or have very small water reservoirs. This means the flowers only have the water in the floral foam. Within about 24 hours, the foam is dry so flowers start to wilt. Heat expedites/exacerbates this. We are in Florida, so it is usually HOT! And, to cut costs, most funeral homes - NOT ALL!!! - will turn off their air conditioners when employees are not present. Hot!! 'nuff said? When you lose a loved one, the last thing you want to have to do is fret about the flowers. And you certainly do not want to sit at a viewing or service looking at wilted flowers. The thought of that is heartbreaking to us! 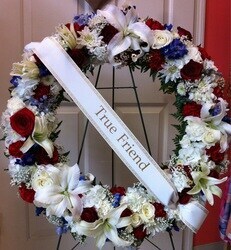 Trust Oviedo Florist to make sure the arrangement honors your loved one and is there on time and as fresh as possible!